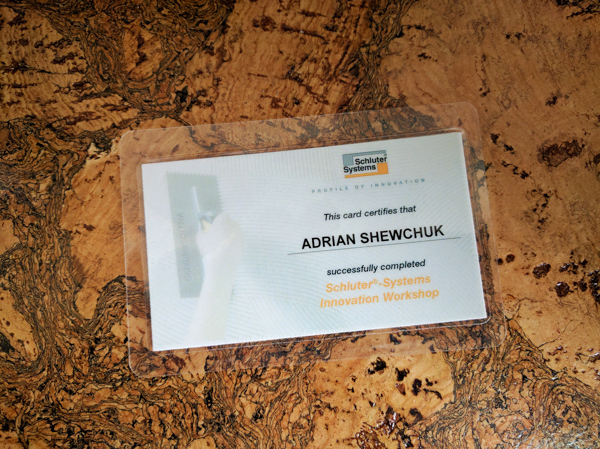 After having developed an extpertise in the use of Schlüter products over the years since around 1996, I finally had the opportunity to attend the Schluter 2-day professional training workshop and seminar at their Canadian headquarters in Ste. Anne-de-Bellevue, QC whilst in Montréal. Exchanging new ideas and technical information with Schlüter’s top technical reps and fellow professional installers was an invaluable experience. The Schluter systems I install such as electrically-heated floors, completely waterproof shower systems, uncoupling floor systems for crack-free stable floors, etc. are all covered by a lifetime warranty.